How sweet is to see Katie & Suri walking to school everyday :) The duo was pictured in their route to another day at the Avenue school in NYC on Wednesday, October 9th 2013. 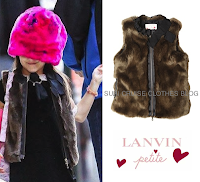 Suri is wearing Amber dress ($356) from F/W 2013 Collection by Pale Cloud (she first wore on October 2nd 2013), Techno Mink Vest ($805) by Lanvin Petite F/W 2013 Collection (she first wore on September 18th, 2013) and Cupcake canvas shoes from S/S 2012 Collection by Start Rite (she first wore on September 16th, 2013). I like Suri's dress and they really look nice to her. She looks fashionable!